This versatile instrument, developed at Harvard University, may be used among other purposes for experiments on stress and strain under tension, compression and shear; resistivity; compressibility and polymorphic transitions, including compression to 100,000 bars in a second stage inner cylinder; viscosity and simple compactions at temperatures as high as 1500oC. 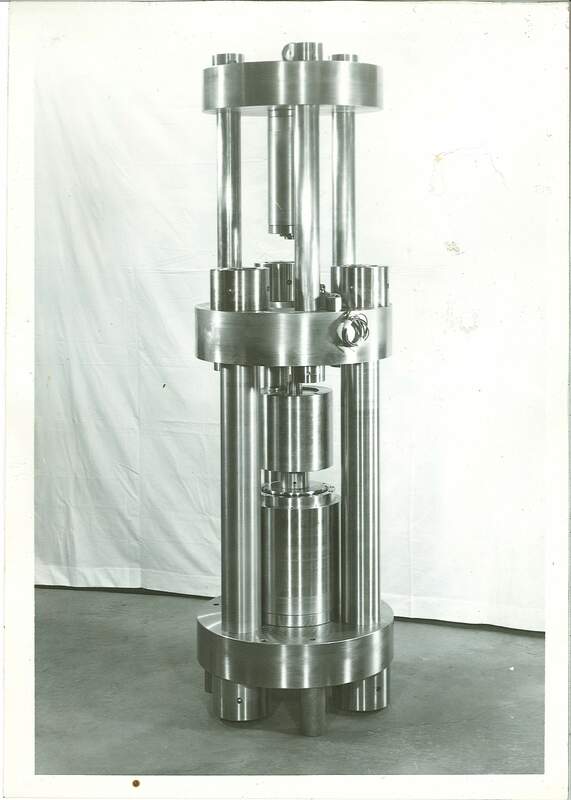 The lower half of the apparatus includes a press frame and a 500 ton jack useful for many applications involving piston and cylinders, anvils (particularly, the Harwood spherical anvils) and quasi-hydrostatic devices such as the N.B.S. tetrahedron, a modified Boyd-England apparatus, the Harwood radial press, and the Harwood hemi-spherical container with flatted spherical piston, (pat. # 3,268,951) the last four for ultra-high pressures. For studying parameters of extrusion. Billets pass through die from chamber capable of 30Kb into receiver at back pressure variable from atmospheric to 20Kb. For further information about the 30kb apparatus please refer to the Harwood article “A Contemporary Version of the Bridgman-Birch 30-kb Apparatus and Certain Ancillary Devices” written by D. H. Newhall and L. H. Abbot.